Our craftsmen take pride in their work and strive for excellence. We are committed to quality from the selection of the wood to the finished product. The native Iowa hardwoods (walnut, hickory, ash, cherry, sycamore and oak) have been cut down within a 100 mile radius of the shop. This truly is a "Made in Iowa" product. We also steam bend our own wood on jigs and patterns that we have designed. This allows us to create a chair for a small child all the way up to a 7 foot tall, 350lb. man. To us, this craft is an art. Each piece is made with artistic skill and care and it is the integration of function and design. 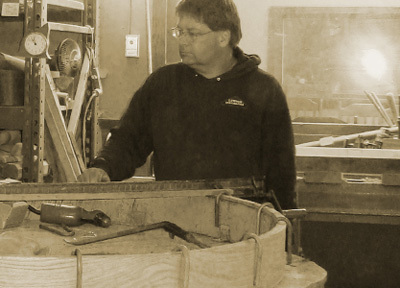 Woodworking has always been a passion for owner and designer Rance Hilton. His interest began when, as a little boy, he would help his grandpa cut boards on a table saw. After high school, Rance applied to work 2-3 days at the shop (now Hilton's Furniture) with the former owner, Doc, but there were so many other woodworkers using the equipment (1919 band saw, a 1930 mortise machine, a 1930 stroke sander) he moved on. Eighteen years later, when Doc needed his help, Rance returned to build rockers. In 2007, Rance bought the shop and renamed it Hilton's Custom Made Furniture.